My husband and I both love to make pizza, but we like different pizza styles. I prefer hand-tossed or thin crusts, and my favorite kind of pizza is pizza margherita, although I do like some sauce occasionally or even a pizza blanca. My husband loves Chicago style pizza swimming in sauce, deep dish or stuffed. He makes a different kind of sauce, and I’ll post the recipe the next time we make a stuffed pizza. 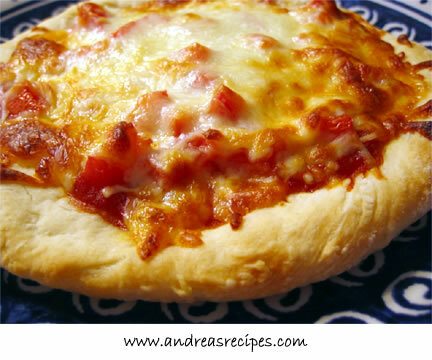 Check out the Easy Bread Machine Pizza Dough recipe for an easy tasty crust to go along with the sauce. 1. Prep all the ingredients first and have them sitting ready to go. The recipe cooks fast, so this step is important. 2. In a medium saucepan, sauté garlic in oil until golden. Watch it closely as the garlic can go from golden to burned in a nanosecond. 3. Add tomato paste, water, wine, sugar, oregano, basil, and cheese. 4. Season with salt and pepper, to taste. 5. Simmer for 10 minutes over medium low heat. Remove from heat and spread over pizza prepared pizza dough. Covers two medium pizzas or one large pizza. I made this sauce but added a third tablespoon of wine. It is amazing. Tastes so authentic. I put it on a pizza with chicken, green onion & mozzarella cheese. Thanks for posting this up. I’m definitely bookmarking this site for future reference.